Working alongside Data Technologist and Researcher David Young we designed and developed a tool to help visualise data collected as part of my practice-based PhD research. 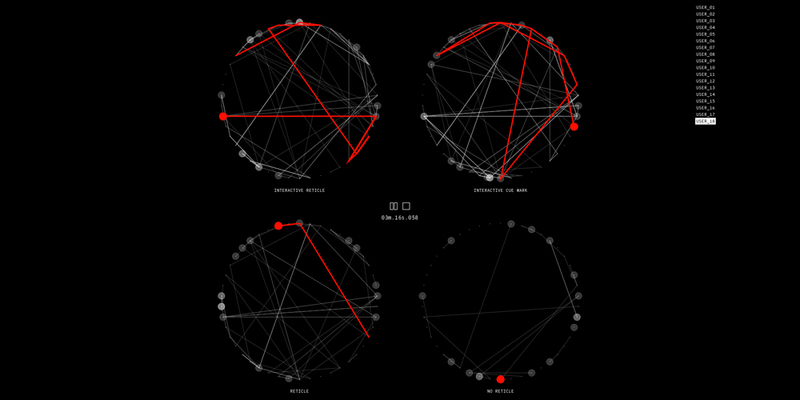 The Virtual Gaze Interaction Network (VGIN) allows users to navigate participant interactions with four different reticle aesthetics. Here individual and collective participant interactions can be controlled towards an aesthetic apprehension of the effects these different interfaces have on user experience. The circular design of this application compliments the spherical scenes made visible by hovering over the nodes in each network. Alongside this function, is the metadata for each scene allowing users to conduct macro and/or micro level analysis of these interactions. Embodied in this aspect of my research is the potential to expand and develop open source toolkits for exploring how people engage with interactive 360° film. For now it is best perceived as an artistic collaboration that addresses new ways of looking at how we interact with virtual worlds and their dominant interfaces. "David Young is a researcher interested in archiving media technologies, the history of computing, and the cultures of military research in the United States during the Cold War. His website is a log of archival curiosities and marginalia found during his research process. It can be accessed at dvyng.com"